Jaxon Filtration produces custom designed canisters either from your specifications, replication of an existing element, or modification of an existing design. We are able to produce small batches for research and development to ensure the end product solves your filtration needs to your specifications. We are able to use stock supplies or custom order your material to create exactly what you need. Triple stitched handles for integrity. Double stitched seams for strength and durability. Chemical resistant polypropylene migration barrier. 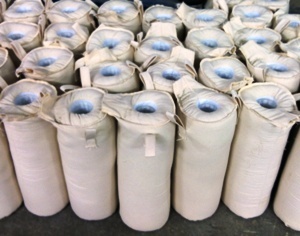 Rugged 8-ounce cotton duck bag material that resists damage during installation and removal. Polypropylene center tube, also available with removable cardboard center tube. Packed to capacity by a vibratory process to minimize any settling during shipping. Not sure what you need? Our experts are available to troubleshoot your problem, supply options and work with you to develop the exact solution you are looking for.